Action Against Hunger continues to be at the forefront of bringing about positive and lasting change in the lives of those affected by hunger. Last year, we reached a record 20.2 million people in nearly 50 countries through interventions in nutrition and health; water, sanitation and hygiene; food security and livelihoods; mental health and care practices; and disaster risk management. The majority of these people were in Africa (66 per cent), followed by the Middle East (15.1 per cent) and Asia (14.8 per cent). Following the declaration of looming famine in Nigeria, Somalia, South Sudan and Yemen, Action Against Hunger was quick to respond; alongside the scale-up of our existing operations, we deployed our emergency pool to Nigeria, Somalia and Yemen, and have been delivering lifesaving interventions across all four countries. We provided assistance to eight million people in the four countries last year, helping to avert famine. In total, Action Against Hunger launched swift, life-saving responses to 39 emergencies around the world. Carima Cali Comadug, 26, was among hundreds of thousands forced to flee when violence erupted in Marawi, the Philippines. She described her experience to Action Against Hunger: “Our lives were entirely changed by that single event. Before, 50 pesos was just a small amount for us. Now, there’s so much value to it because it’s all you’ve got. We lost everything”. Action Against Hunger was on the ground within 48 hours of the start of the conflict and responded with projects in nutrition and health; food security and livelihoods; shelter; and water, sanitation and hygiene. Action Against Hunger was the only international NGO to deliver assistance in some areas of Marawi, despite some security concerns. 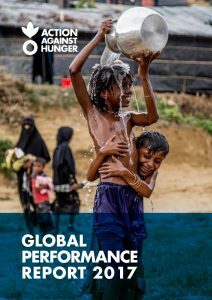 Action Against Hunger supported 4.5 million people through nutrition programmes last year; 56 per cent of whom were female and 41 per cent of whom were under the age of five. Life-saving treatment provided to severely malnourished children increased again to reach half a million in 2017. One in three people supported by Action Against Hunger received assistance for water, sanitation and hygiene. We promoted the use of cash transfers to give people a choice on how they meet their needs, implementing cash-based responses in 34 countries, including cash assistance to over 4,000 families in Mosul, Iraq. We scaled up our mental health activities, but know there is much still to do to develop our understanding of the most effective ways to respond to mental health and hunger. During 2017, our mental health specialists in Cox’s Bazar, Bangladesh responded to a significant influx of Rohingya people from Myanmar, many of whom had acute psychosocial needs due to trauma and stress. In total, we reached over 200,000 people in Bangladesh last year with mental health support. We deepened our engagement with rapid response mechanisms to enable us to respond more effectively to localised, under-reported humanitarian crises. In Bangladesh, Action Against Hunger is helping to set up the first national Start Fund that places funding and decision making into the hands of local and national NGOs to respond to humanitarian emergencies in Bangladesh within 72 hours. We conducted a logistics perceptions survey for the first time and 72 per cent of our staff reported they were strongly satisfied or satisfied with the logistics services provided by Action Against Hunger. The findings also showed more work is required to further integrate logistics as a programmatic function. In response to emergencies such as the one in Marawi, our logistics systems ensure that items that are vital for survival arrive and are distributed to vulnerable populations in a timely and efficient manner. Our total income in 2017 surpassed all previous records, rising to €412 million. This included an exceptional rise in in-kind support for our humanitarian response in Nigeria. More resources enabled Action Against Hunger to reach over 20 million people last year. Ninety per cent of our expenditure in the year was dedicated to programme activities. Action Against Hunger is committed to searching for more effective solutions to address hunger and we continue to grow our research portfolio, with 52 projects ongoing in 2017. In Kenya and South Sudan, we are testing a more effective way of treating acute malnutrition, while in Ghana we researched the application of Moringa leaves as a handwashing product in water and soap scarce contexts. Our advocacy work included the development of an advocacy toolkit on the Sustainable Development Goals related to nutrition and we supported Chad, Madagascar and Niger to integrate and prioritise nutrition in national plans. We contributed to evidence-based advocacy in Sierra Leone by tracking the government’s expenditure on nutrition interventions. No organisation can effectively tackle the complicated issues associated with hunger alone. In Nepal, we successfully handed over nutrition interventions in three districts to the local government. In Zimbabwe, we partnered with the University of Zimbabwe to research the effectiveness of airtight storage technology to reduce the contamination of maize, and in Guatemala, we continued to work with private companies to put in place disaster contingency plans. During 2017, we were excited to develop fundraising partnerships outside of the food industry, raising £1.1 million for a Healthy Mums, Healthy Kids appeal through matched funding from the UK government. These are just a few examples of the incredible work of our staff and partners throughout the world last year. We hope you enjoy exploring the rest of our achievements in these areas as you read this report.